Buffalo Bayou Park stretches from Shepherd Drive to Sabine Street between Allen Parkway and Memorial Drive. 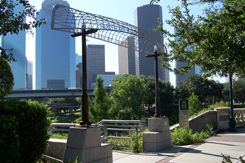 The 160-acre park is managed for the Houston Parks and Recreation Department by the Buffalo Bayou Partnership, with annual funding provided by the Downtown Tax Increment Reinvestment Zone (TIRZ #3). The Partnership has recently completed a $58 million renovation and development of the park. For more information regarding the park’s amenities and programming, visit buffalobayou.org. The Lee & Joe Jamail Skatepark is a 30,000-square foot in-ground facility overlooking Buffalo Bayou. 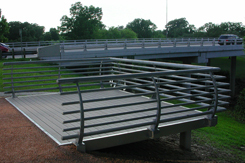 It is accessible from Sabine Street and Memorial Drive. It opened in June 2008, and has been the scene of some of the skateboard world’s biggest events. It was made possible by some of Houston’s leading families, including the Jamails, the Houston Downtown Management District, and the Huffington Foundation, as well as the City of Houston and the Houston Parks Board. In the 1860’s – 1880’s, Frederick Law Olmstead, the inventor of the profession of landscape architecture and the design genius behind New York City’s Central Park, pushed for urban planning that used natural environmental features as open parkland in order to reduce urban density and inject a carefully cultivated semblance of natural beauty into American cities. An 1892 design by George E. Kessler for a park and boulevard system that used these ideas in Kansas City, Missouri, influenced city planning throughout the American South and Mid-West, and Houston city fathers took a long look at the future from its perspective. A flat, featureless plain didn’t give city planners of the first decades of the Twentieth Century much to work with, but the bayous around the city had some promise for natural beauty if the engineers changed their viewpoint, which to that point considered them to be utilitarian, at best. A series of floods, too, cried out for planning to prevent future disasters. Thinking of the bayou banks in terms of parks and recreation areas empty of buildings, rather than places to tie up boats at warehouses, accomplished both those goals. The banks of Brays Bayou were still in a wild state and easily turned into the North and South MacGregor Way parkway between Hermann Park and MacGregor Park, but the same could not be said about Buffalo Bayou upstream from the city. However, the flooding situation and the new westward expansion upstream, which included River Oaks and Memorial Park, required a new way to use Buffalo Bayou. The roads that led west toward German settlements on the Brazos River were San Felipe Road (now West Dallas Street) and Washington Street (now Washington Avenue). Several cemeteries were grouped along the bayou, perhaps to take advantage of the peaceful scenery. The grandest of these was Glenwood Park Cemetery (now known as Glenwood Cemetery), whose curving lanes and shady trees had invited Nineteenth Century Houstonians out for Sunday picnics before the creation of City Park (now Sam Houston Park) gave them an official place for outdoor recreation. Freedman’s Town had formed around San Felipe Road and City Cemetery (now Founder’s Memorial Cemetery) and Beth Israel Cemetery, and new housing developments were spreading westward up Washington. The idea of acquiring all the land along the bayou to build a parkway seemed unlikely to be accomplished due to the presence there of the cemeteries, but a start was made in 1899 with the purchase of the Samuel W. Young brickyard on the north bank of the bayou and the Noble House and Mrs. Sarah Byers’s nursery on the south, which formed City Park. In 1906, the privately-owned Vick’s Park and the Houston Waterworks Company were purchased, both on the banks of the bayou. A 1909 report urged prompt action to acquire more land for parks before it became too expensive for the city to buy. A three-member Board of Park Commissioners was formed in 1910 to advise the Mayor and City Council on the acquisition, development, and maintenance of public parks. Mayor Horace Baldwin Rice wanted the Board to establish a circle of parks connected by a system of landscaped boulevards around Houston. The Board hired landscape architect Arthur Coleman Comey to write a comprehensive park report, which suggested that the area’s bayous naturally lent themselves to parkland, and very little else. Where the bayou banks were privately owned, they were poorly-maintained and depressed property values, whereas public ownership would have the opposite effect. 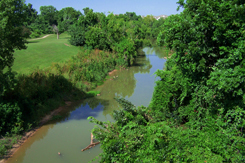 It recommended that the banks of Buffalo Bayou be purchased as quickly as possible to a point a mile and a half beyond Vick’s Park, which had been renamed Cleveland Park. A pair of two-lane thoroughfares along the top of the banks would flank the proposed park. The Comey report also urged the founding of a Civic Center at the eastern end of this proposed park, where Capitol Avenue ended at the bayou. The report helped galvanize a vote for a $250,000 bond election for park acquisition. More park property was acquired along Buffalo Bayou, one 20-acre tract next to Cleveland Park and across the water from Hebrew Cemetery, and a 35-acre tract at the intersection of Shepherd’s Dam Road (now Shepherd Drive) and San Felipe Road (West Dallas). In 1914, George E. Kessler, famous for his Kansas City parkway plan, was hired by oil tycoon Joseph Stephen Cullinan as consulting landscape architect to the Board of Park Commissioners. In 1916, he turned his design attentions to Buffalo Bayou. He planned a formal garden for Sam Houston Park and was involved in the acquisition and planning of a 70-acre tract west of Sam Houston Park for the South Texas Permanent Exposition. This tract included portions of the W. R. Baker Addition, the Hardcastle Addition, and the golf links formerly owned by the Houston Golf Club and subsequently owned by the William Marsh Rice Institute. Three service organizations, the Young Men’s Business League, the Rotary Club, and the Red Roosters, negotiated these transfers. The exposition grounds were intended to be park-like and be part of the planned system of public parks along Buffalo Bayou. Kessler designed a channelized bayou devoid of oxbow bends, a landscaped mall, a circuit track around the golf links, pavilions for the exposition space, street realignments, and a pedestrian promenade along the south bank of the bayou. The funding ran out long before the South Texas Permanent Exposition was built, partly due to the United States’ entry into World War I and partly because there was no permanent park acquisition fund. After the war and into the 1920’s, the Chamber of Commerce pushed a renewal of these park projects, as well as such planning goals as the passing of zoning, which Houston still has not achieved. The plan for the Exposition grounds was abandoned. The Kansas City design firm Hare & Hare, which had designed the town site of Bellaire and the Forest Hill subdivision across Brays Bayou from the Houston Country Club (now Gus Wortham Park and Golf Course), inherited many of George Kessler’s projects after his death in 1923. They would be very active in further planning of the Buffalo Bayou park project, as well as such prominent projects as a master plan for Hermann Park. In April 1924, Will, Mike, and Ima Hogg offered 1,503 acres upstream from downtown to the City at favorable cost in the interest of turning it into a public park. The brothers donated $50,000 to help the City make the first payments on the tract, which came to be Memorial Park. This development, and the founding of River Oaks, the Hoggs’ real estate venture across Shepherd’s Dam Road from the park tract bought by the City in 1913, brought renewed attention to the now-dormant idea of the Buffalo Bayou parkway. Over the next few years, Will Hogg’s civic dreams led him to purchase most of the rest of the property that became Buffalo Bayou Park, which he then sold at cost or through condemnation to the City. Hare & Hare proposed locating Kessler’s Civic Center around Hermann Square, where a new Houston Public Library was under construction, with plans to connect it to Sam Houston Park and the Buffalo Bayou parkway. The park was redesigned to allow for easy transit by automobiles and to be the eastern-most part of the Buffalo Bayou parkway, which Hare & Hare intended to run to Memorial Park. Buffalo Drive (renamed Allen Parkway in 1961) was built westward from downtown to connect to Kirby Drive in 1925-1926, forming the southern border of what would become Buffalo Bayou Park. A plan for the north bank parkway took tentative shape. A north-south street was built across Cleveland Park to connect Waugh Drive and Heights Boulevard, but design for the east-west parkway to be called Memorial Drive stalled over the City’s inability to acquire right of way through Glenwood and Deutsche Gesellschaft (now Washington) Cemeteries. Bayouside property had been acquired as far west as Reinerman, and it was decided that Memorial Drive could diverge from the bayou at that point and be diverted onto May Street, despite objections that, once passed up, the bankside property would be forever out of reach for the City. The May Street plan was implemented, but changes of administration and the Great Depression stalled further progress on Memorial Drive. For years, it reached neither Memorial Park nor Cleveland Park. During the 1930’s, construction of the Sam Houston Coliseum and Music Hall ate up some of the bayouside property originally planned for Buffalo Bayou Park, and in 1939 the current City Hall was built adjacent to Hermann Square. Other parkland was sacrificed for the construction of Jefferson Davis Hospital and the public housing project San Felipe Courts (now Allen Parkway Village) on the south side of Buffalo Drive, and the DePelchin Faith orphanage and St. Thomas High School were built on land once intended for the expansion of Cleveland Park, on the north bank, due, possibly, to land swaps with the Hogg Brothers’ Varner Realty Company. In 1940, Mayor Oscar Holcombe and City Council established the Department of City Planning, and Ralph Ellifrit, who had ties to Hare & Hare, was hired as Planning Engineer. Landscaping the park, which had long been put off, began at this point. Planning for the extension of Memorial Drive to downtown went on through World War II, along with a series of north-south streets intended to connect the two sides of the bayou. Suburban expansion westward made it obvious that two-lane parkways restricted to pleasure driving would be insufficient for the future, so plans were made to rebuild what already existed as multi-lane thoroughfares with limited access. Between 1945 and 1951, Buffalo Drive was rebuilt to meet those standards, and work took place on Memorial Drive between 1953 and 1956. Sidestepping the cemeteries was achieved by building that stretch of the roadway around them, over the bayou itself. The final connection between Memorial Drive and downtown, an overpass above Houston Avenue, was finished in 1960. A huge cloverleaf interchange between Waugh Drive, Heights Boulevard, and Memorial Drive ate up large sections of Cleveland Park, resulting in two much reduced corners, one of which was renamed Spotts Park. 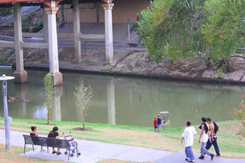 Ultimately, the original point of Buffalo Bayou Park, to have recreational space amid natural beauty on both banks of the bayou, was lost when the roadways alongside it became high-use thoroughfares. It became difficult for pedestrians to access the south side by crossing Allen Parkway, and next to impossible on the north side due to the presence of Memorial Drive. The only way to reach one bank from the other by foot or bicycle was by using the Sabine Street, Montrose Boulevard, Waugh Drive, or Shepherd Drive bridges, which were designed more for automobile traffic than for park visitors. Flood control issues during the 1950’s included rechanneling some parts of the bayou between Shepherd Drive and downtown, eliminating bends and widening and flattening parts of its course. Native vegetation, long a beautiful hallmark of the bayou, was largely eliminated. Grass was planted on the redesigned banks. By the mid-1960’s, a plan by the Army Corps of Engineers to straighten the bayou west of Shepherd Drive to the West Belt, strip it of vegetation, and line it with concrete, which had already been done to many miles of Brays Bayou, became the impetus for the creation of the Bayou Preservation Association, with Terry Hershey as its president. That stretch of the bayou was in a largely natural state and highly prized for its beauty. It was lined with expensive homes in River Oaks and the Memorial and Tanglewood neighborhoods. Pressure from then-U.S. Representative George Bush and the Secretary of the Interior, Stewart Udall, caused the project to be cancelled. This successful attempt at conservation of natural beauty emboldened local park activists, with the result that there are several active local groups today, and Harris County has named a bayou-hugging park after Terry Hershey. However, nothing could stop the juggernaut of freeway construction from altering the bayou parkway. Beginning in the mid-1950’s, Interstate 45 construction invaded land intended for the bayou parkway. Support columns for the freeway were built next to, or in some cases in, the course of the bayou, and entrance and exit ramps ate up large stretches of land. Sam Houston Park and the Civic Center were cut off from Buffalo Bayou Park. More park space was relegated to construction projects, first for the 1967 Albert Thomas Convention Center (now Bayou Place), which backed up to the bayou across the street from the Sam Houston Coliseum, and the 1970 City Hall Annex, which did the same, across Bagby Street from the main 1939 City Hall. Parkland was restored to the area in the form of Tranquillity Park, a 4.3-acre expanse of futuristic fountains and plantings atop an underground garage across Walker Street from City Hall and Hermann Square, but it does not physically connect to the Buffalo Bayou parkway. Sesquicentennial Park, named in 1986 to commemorate the 150th anniversary of the founding of the Republic of Texas, was completed in 1988, and adds four acres to downtown on the bank of Buffalo Bayou, next to the Wortham Center. Designed to enhance the bayou with fountains, walkways, staircases, and sculpture, making the waterway an attribute rather than the utilitarian eyesore it was in the early parts of the Twentieth Century, Sesquicentennial Park would connect with Sam Houston Park and Buffalo Bayou Park, if not for the existence of the City Hall Annex, Bayou Place, and the Hobby Center for the Performing Arts, which has replaced the Sam Houston Coliseum and Music Hall.